It was shown in the web manga series Binan Koukou Chikyuu Seifuku bu Love! that is was Kinshiro who found Zundar one rainy day. 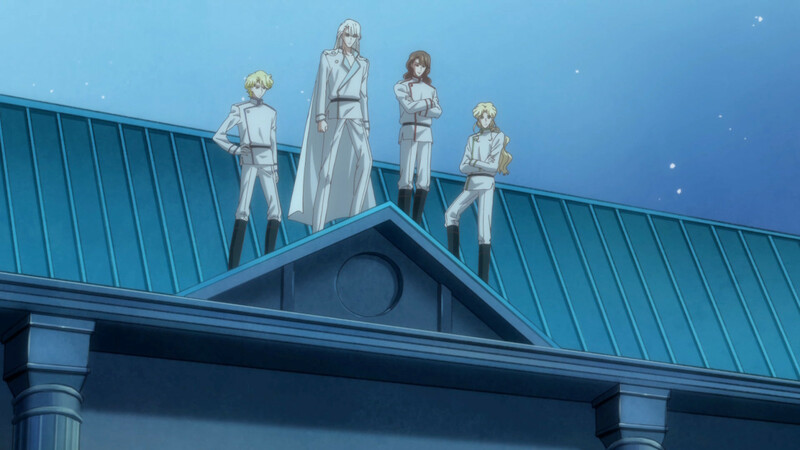 It was also revealed in the web manga that it was Zundar who gave Kinshiro and the other student council members their Conquest Rings as well as encouragement and guidance for them to form the Conquest Club and become Chevaliers with their activities that set in motion the events for season one of the anime series. Each Chevalier has a different Transformation when he puts on their Conquest Ring. Each of the Chevaliers carries his own sword (rapier) to which they can summon instantly, they all look the same. Blur (pixelisation) as with the Battle Lovers/Defense Club, the chevaliers have their identities cloaked: Being their faces blurred/pixelated and their voices modified so other people including their enemies are unable to identify them. Caerula Adamas (カエルラ・アダマス, Kaerura Adamasu) is Latin for "blue diamond" - the whole Blue Diamond/Gold/Silver/Pearl motif is an elaborate pun on a Japanese brand of washing powder! However, adamas, meaning diamond, also happens to mean "unconquerable". The Chevaliers’ names are all based on French heraldry nomenclature (Or- gold, Argent- silver + Akoya being perle). Or Aurite – Gold Argent – Silver Perlite - Mother-of-pearl. They can perform a group attack called Ultima Adamas (ウルティマ・アダマス Urutima adamasu) which is an attack that releases a ray/beam of each of their image colors at their enemies. Caerula Adamas from Binan Koukou Chikyuu Bouei bu Love! Game!